Now we’re using the training we implemented at Google as the basis of a new program available to anyone, anywhere, as part of the Grow with Google initiative. No tech experience or college degree is necessary. 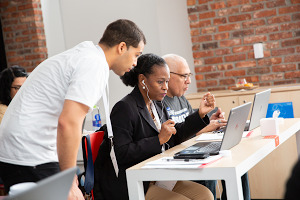 With over 64 hours of video lessons and a dynamic mix of hands-on labs and other interactive assessments, all developed by Googlers, this certificate program introduces people to troubleshooting and customer service, networking, operating systems, system administration, automation, and security—all the fundamentals of IT support. Throughout the program, people will hear directly from Googlers whose own foundation in IT support served as a jumping-off point for their careers. Since we know training is just the first step, we also want to help with the next one—the job search. Once people complete the certificate, they can opt in to share their information directly with top employers, including Bank of America, Walmart, Sprint, GE Digital, PNC Bank, Infosys, TEKsystems, UPMC, and of course, Google, all who are looking to hire IT support talent. To ensure job seekers from all backgrounds have access to the program, we’re subsidizing the cost of the certificate on Coursera to $49/month and providing financial support to more than 10,000 learners in the United States. 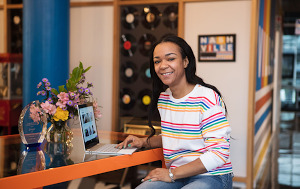 Need-based scholarships, funded by Google.org grants, will be offered through leading nonprofits focused on underrepresented communities including Year Up, Per Scholas, Goodwill, Student Veterans of America, and Upwardly Global. Full financial assistance is also available to those who qualify. You can find out more and enroll at the Google IT Support page on Coursera. I’ve seen firsthand how educational opportunities can transform people’s careers and lives. By making the Google IT Support Professional Certificate accessible on Coursera, we hope to open the door for everyone to begin a career in technology.